In our Irish Catholic family, a fun Saint Patrick’s Day party is always part of our spring celebrations. Our sweet baby Daniel Patrick was born on Saint Patrick’s Day a few years ago, giving us even MORE reasons to throw a party! 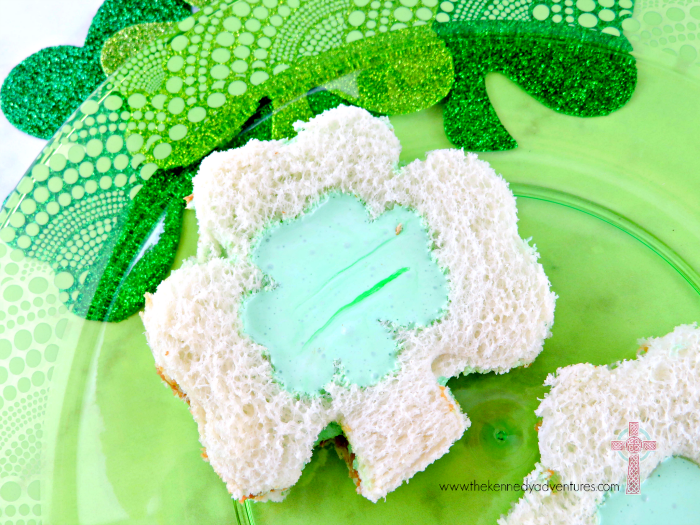 If you’re looking for a fun lunch idea for a Saint Patrick’s Day party with your friends, take a peep at this twist on a peanut butter sandwich ….. Shamrock Sandwiches. Grab your glass mixing bowl and your marshmallow creme. Spoon out some marshmallow creme into the bowl (we use about a cup), then stir in green food coloring. Mom tip – if you have extra, this stores well in the fridge for a few days. My kids love to dip graham crackers or shortbread cookies in this ‘Irish Creme’. 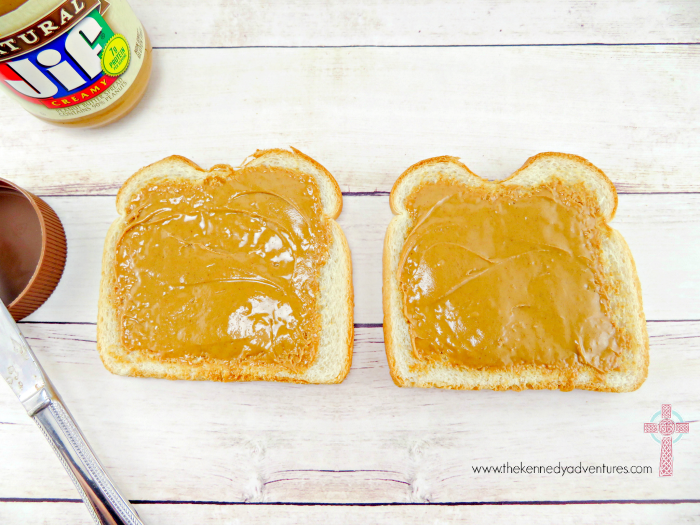 Take a slice of bread and cover it with peanut butter, like you’re making a sandwich. 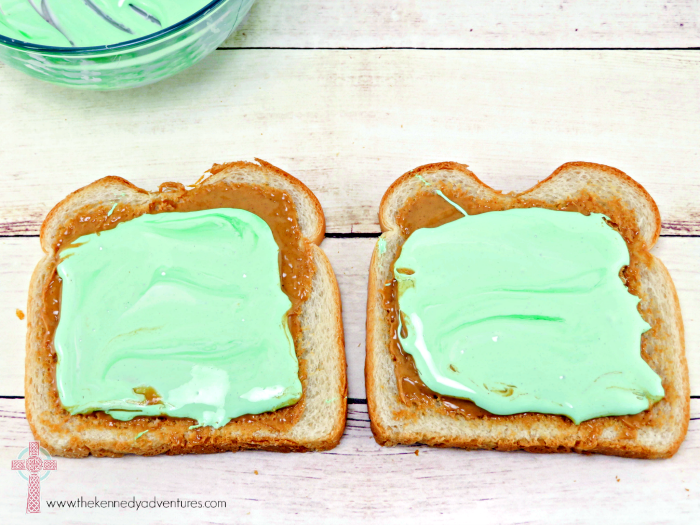 Then, take the green marshmallow creme, spreading it on top of the peanut butter. 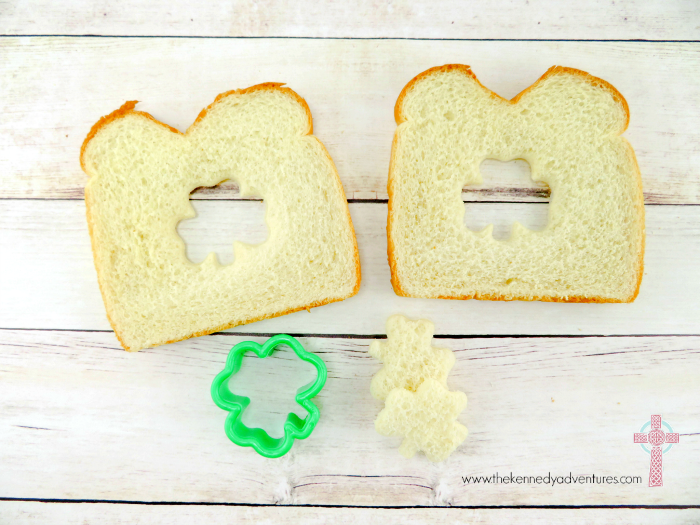 With the second slice of bread, you’re going to use your small shamrock cutter to make a shamrock right in the middle. Place this slice of bread on top of the slice covered with peanut butter and marshmallow creme, making a full sandwich. 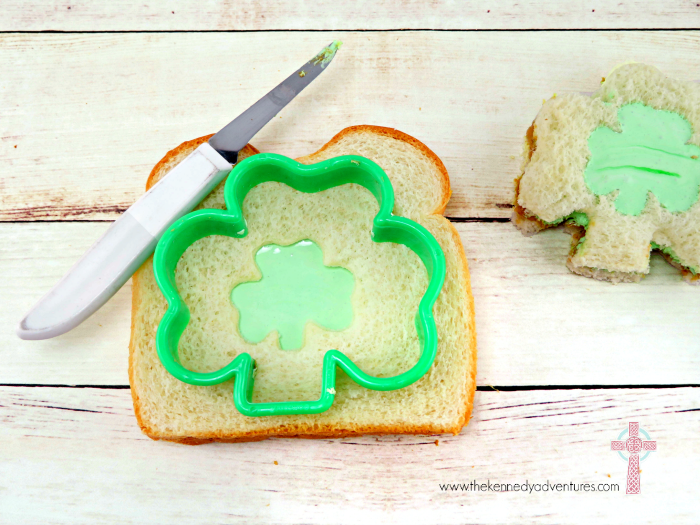 Place the large cookie cutter in the middle of the sandwich and cut around it with a knife, creating a shamrock sandwich. 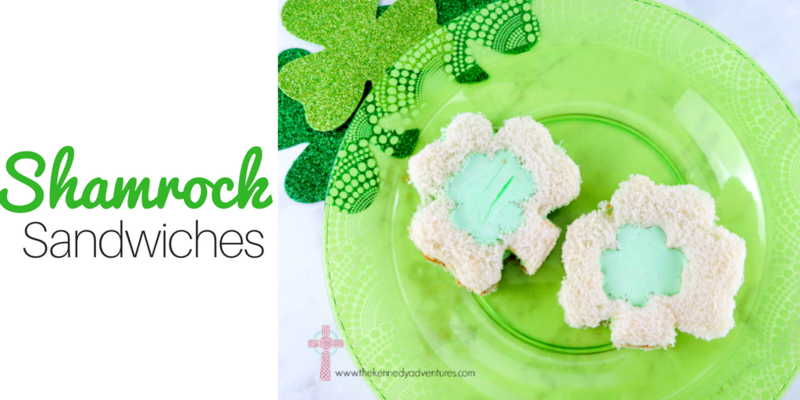 Serve these on your favorite Irish platter, and read some St Patrick’s Day books to your kids while they enjoy their treat! What kind of treats are you serving at your St Patrick’s Day party? I’d love to hear about them! 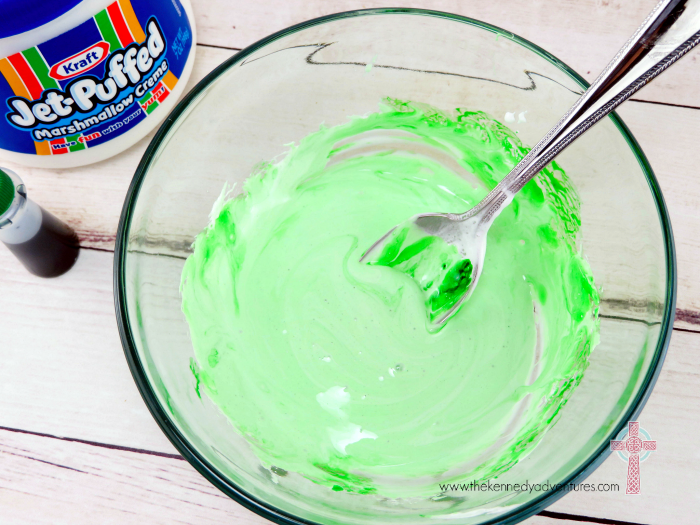 Add some marshmallow creme to a bowl and add a few drops of food coloring, then mix well. Spread some peanut butter on a slice of bread, then spread some marshmallow creme on top. 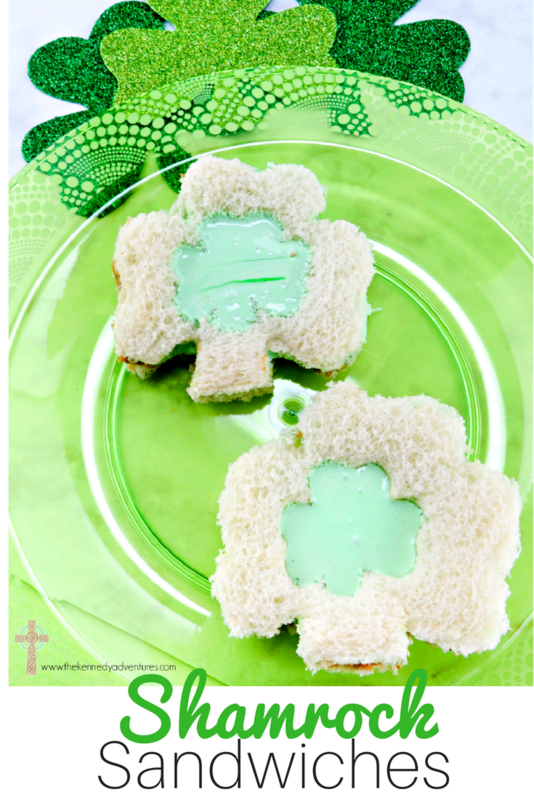 Take the other slice of bread and cut out a small shamrock in the middle. Place the slice of bread on top of the other peanut butter and marshmallow creme slice. Now, place the large cookie cutter in the middle of the sandwich and cut around it with a knife. (if you press the cookie cutter down, the peanut butter and marshmallow creme will come out the sides, so it’s best to cut around it). Ready to serve and enjoy!! These look so cute and sound SO good! Thanks for sharing.